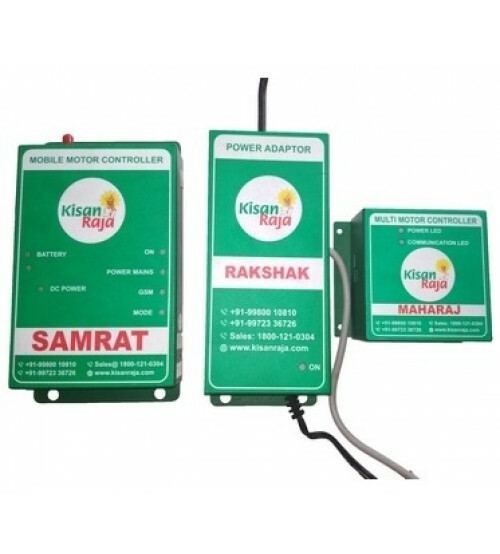 Kisan Raja's Maharaj is a GSM based Mobile Motor Controller that enables the farmer to operate more than one upto three agricultural motor pump sets anytime and from anywhere using their mobile or landline phones. A simple User friendly device that is very easy to use and assists the farmers in addressing a number of problems such as water, electricity, money and motor. i) Motor ON/OFF control through Call, SMS and Missed Call options. ii)Four Different Operating Modes - Auto Mode, Manual Mode, Timer Mode and Bypass Mode. iii)Operates in 3 Phase, 2 Phase and Single Phase Power. 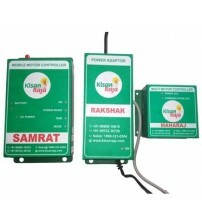 v)Maharaj can control upto 3 motors but all the three motors must be within a range of 100m distance. vi)Dry Run, Phase reverse and Phase unbalance Protection. vii)Provision of Alert during phase failure and wire-cut. xiii)LED indication for favorable power, auto mode and bypass mode. xix)IVRS in multiple regional languages. 12 months warranty for any manufacturing issues subject to use of product as per the suggested installation guidelines. Any defects due to improper installation techniques, voltage and load conditions will not be covered.